Gautam and Parineeta Sharma of Atrangi share the story behind curating their unusual products. Spark plugs, nut bolts, clutch kits, washer, engine and wheel chain, bearings, these things bring images of bikes or cars to mind, metal art is not something that necessarily figures in that list. But as one enters the home of Atrangi founders, Gautam and Parineeta Sharma, it soon becomes clear that spark plugs are a byword in their lineup of ‘out of the box’ products. Started in 2015, the duo came up with the idea of curating quirky products that drew heavily on concepts of recycling and upcycling. “Atrangi means extraordinary or unusual which defines our products. Both of us love travelling and would often seek out local craftsmen and artists in the countries we visited. We would see all these beautiful stuff around us and thought why not curate it on a platform. Everything you see on our website is handpicked from different countries,” says Parineeta Sharma who used to work as cabin crew with Emirates airlines previously. Elaborating on the story behind their logo, Gautam shares how they came across a lady selling handmade jewelry in a flea market in Goa. “She showed us this earring made from a coconut shell which had multi-coloured threads woven around it which took a week to make. Fascinated, we bought it. It was a unique earring which definitely drew attention. It got us thinking that there are many artists who lack the platform to showcase their work which led to the inception of Atrangi,” recalls Gautam. An Optimus Prime figure made from bike parts. Their products range from hemp bags, gunny bags revamped into satchels, shoulder bags, coconut shell clutches, UV Glow paintings to wire art, guardian masks and metal art. Admittedly, it is their metal art figures which have the most eye catching designs, Transformers fans will like how the duo has incorporated actual bike parts in the Bumblebee, Optimus Prime figures; there is also the Predator from the Aliens franchise which stands out with its intricate detailing using clutch kits at the back. “The metal art figures are crafted in Taiwan, we give the design to the artists there who send us the finished figures anywhere between 20 days to 2 months,” says Gautam Sharma who worked in the field of software development and website design before going fulltime into Atrangi. Nepal, Thailand, Bali, Morocco, Argentina, Japan and Turkey are just among the many countries they tap into when it comes to sourcing their artifacts. For instance, they have a couple of Yosegi puzzle boxes from Japan which are small wooden boxes with beautiful mosaic work made using natural fine grains and chips of wood. The marquetry harks back to Japan’s Edo period. “We understand the satisfaction that lies in owning something that is unique and can’t be found easily. But getting the artists and workmen from different countries to come onboard is difficult. It took a lot of persuasion, at the end of the day, the universal language is monetary,” admits Gautam. Having left lucrative professions to pursue their dream, the couple says there was a lot of apprehension from family and friends alike about their venture, but they still went ahead. “We realized very early on that working a 9 to 5 job was not for us. Atrangi allows us to do both, travel and explore different cultures and their crafts,” adds Parineeta. 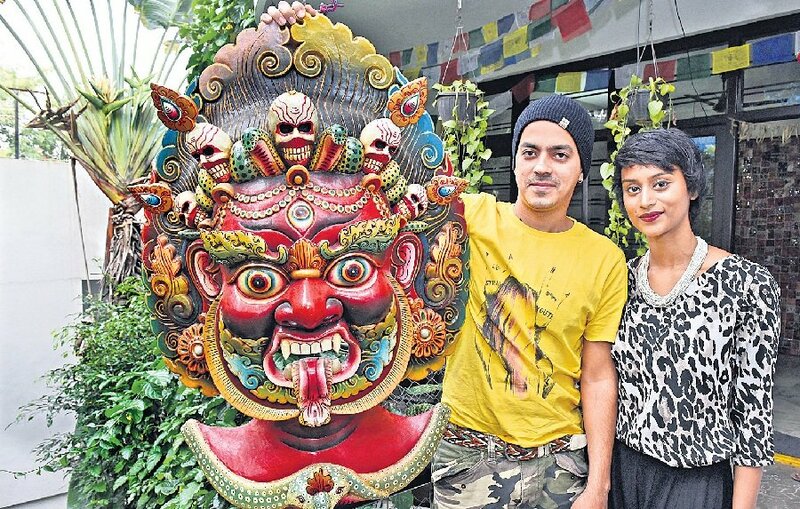 With orders numbering to 200 a month, the couple is planning to new additions to their metal art figures and Bhairav masks and is planning a trip to Nepal in the upcoming months.